What a difference a day makes…again. For the second week in a row, the #18 Terriers followed a disappointing effort and a loss with a dominating performance and a shutout win. Last night in Portland, BU thumped Maine, 7-0. The season-high scoring output was led by a pair of goals by freshman Shane Bowers and three other scores by freshmen. 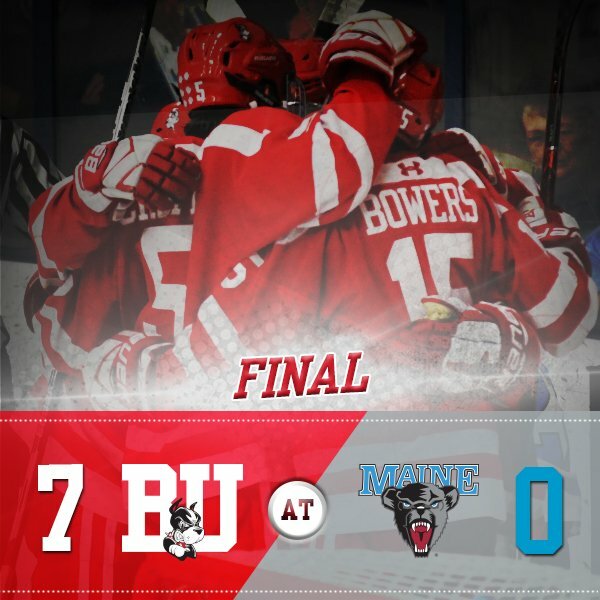 Bowers set the tone just 86 seconds into the game one-timing a Patrick Harper pass from behind the Maine cage with freshman Logan Cockerill also assisting. Bowers nearly scored again in the first period but was denied in tight by Rob McGovern. Early in the second, BU scored on an odd-man rush with sophomore Chad Krys setting up junior Jordan Greenway whose wrister found the top left corner. Freshman Hank Crone, who also assisted on that tally, scored his first collegiate goal nine minutes later, crashing the net on a delayed penalty. Krys and freshman Dante Fabbro had the helpers. 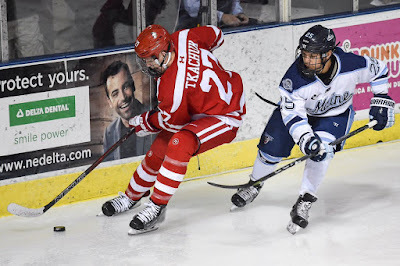 Just before the second period ended, freshman Brady Tkachuk matched Crone with his first goal, knocking home a rebound in tight after freshman Kasper Kotkansalo hit iron for a 4-0 lead. Junior Bobo Carpenter also picked up an assist. Midway through the final period, Carpenter recorded his team-best eighth goal, converting a goal mouth pass from Greenway with Krys picking up his third assist of the game. Just 22 seconds later, Bowers scored his second goal from freshman Cam Crotty. Cockerill closed out the scoring on a power play in the game’s final minute with freshman Jake Witkowski recording his first collegiate point. 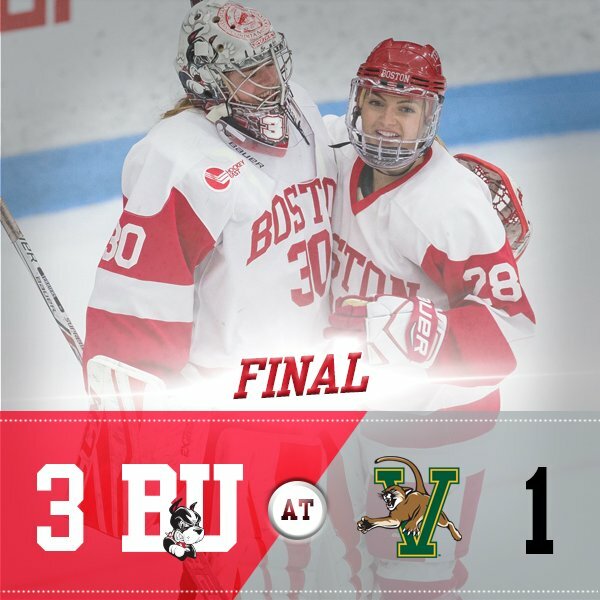 Sophomore Jake Oettinger stopped 30 Black Bear shots, including 13 in the final period, to record his second shutout of the season and the sixth of his career. Kotkansalo finished the game at +4 while Harper and Krys were both +3. After going pointless in his first 11 starts, Cockerill produced a goal and an assist in both games against Maine. 2018 recruits Tyler Weiss and Jack DeBoer each assisted on a goal in the NTDP U17s 5-0 win against Central Illinois. 2018 recruit Ryan O’Connell contributed a goal and an assist to BCHL Penticton’s 10-1 blowout of Cowichan Valley. The 6’2” defenseman has 13 points in 20 games for the Vees. 2020 recruit Dylan Peterson assisted on two goals to give CIHA 18U White a 2-0 lead, but Ottawa 18U AAA roared back with four goals for a 4-2 win. Fifteen year old Peterson, playing up with the U18s, has 10 points in 12 games. Charlie McAvoy recorded his eighth assist in the Bruins 3-1 win at San Jose. Danny O’Regan, just recalled from the AHL where he was the Barracuda’s leading scorer, assisted on the Sharks’ only goal. Terriers completed a sweep of Vermont at Gutterson Fieldhouse with a 3-1 win. Senior captain Rebecca Leslie scored twice, including the second-period game-winner. Senior Victoria Bach added to the lead with a third period goal, her fifth of the weekend. Freshman Corinne Schroeder turned aside 35 of 36 UVM shots.